Ipratropium Bromide Aerosol HFA is an inhalation aerosol supplied in a pressurized stainless steel canister as a metered-dose inhaler with a mouthpiece and a protective cap. 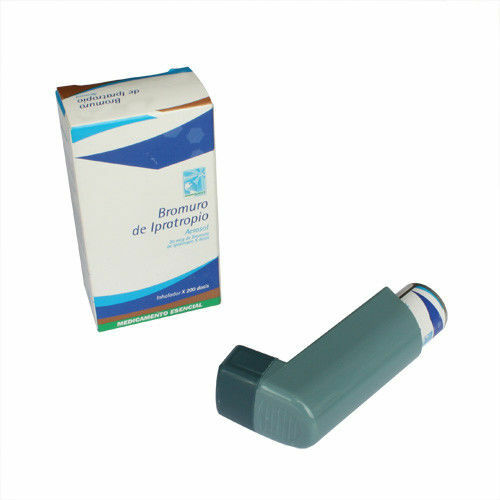 After priming, each actuation of the inhaler delivers 20mcg actuation of ipratropium bromide (as the monohydrate). The product is an anticholinergic indicated for the maintenance treatment of bronchospasm associated with chronic obstructive pulmonary disease (COPD), including chronic bronchitis and emphysema. Ipratropium bromide, a synthetic ammonium compound structurally similar to atropine, is used as a bronchodilator in the management of cholinergic-mediated bronchospasm associated with chronic obstructive pulmonary disease and in the treatment of rhinorrhea associated with the common cold or with allergic or nonallergic seasonal rhinitis.